Shantakumaran Sreesanth had been among India’s finer speedsters in recent times. He was attributed as having the best seam position after the Australian legend Glenn McGrath. Extremely talented, he had the ability to swing the ball both ways prodigiously even on flat belters. His career was cut short after his involvement in the 2013 spot-fixing scandal that ended many careers. He was handed a 5-year ban and ever since, is pursuing the legal route to get back to playing the sport at the competitive level. BCCI hasn’t yet given him the clean chit to be available for selection in either the Ranji trophy or the IPL. 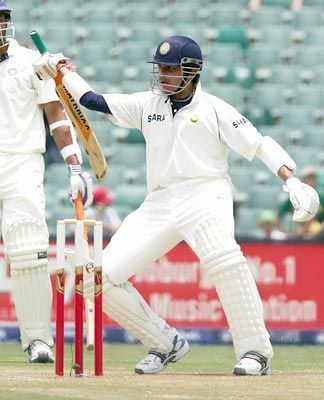 S. Sreesanth was a character on the field. He was a treat for viewers to watch as he was very expressive and aggressive on the field. In this feature, we look back on one such incident involving Sreesanth and Andre Nel that has become iconic. The Wanderers Test during India’s tour of South Africa in 2006 is remembered for several reasons. India bowled out the hosts for a paltry 84 runs in the first innings and went on to win the match by 123 runs despite none of their batsmen scoring a century. That was considered impossible, but the Indian pacers spearheaded by Sreesanth made it happen. The game is also remembered for S Sreesanth’s heroics — he scalped eight wickets in the game and he had a rather memorable tussle with South Africa cricket team pacer Andre Nel which ended up being among the most hilarious and funny incidences on the cricket field. After being put off by Andre Nel, who began targeting the India pacer with short balls and a flurry of words, saying that Sreesanth had ‘no heart’ during the visitors second innings, the Indian tailender lost his cool. And Sreesanth is known for not keeping his emotions under control. Sreesanth swung his willow at one delivery and deposited it into the stands, right over Andre Nel’s head to meet the challenge thrown by the bowler. Andre Nel had to eat his words and go back to his bowling crease post that. However, after hitting the ball from the middle of the bat and seeing it flying into the stands, S Sreesanth, already down at the non-striker’s end, suddenly broke into a dance that left everyone watching in splits. “When I saw him walk out, the first thing I thought was ‘hit him on the head’. To be fair, that was generally my thought no matter who was batting,” Andre Nel told Cricbuzz, recalling the incident. “To be honest, I can’t remember what I said. It was a heat of the moment thing and probably something along the lines of ‘I’ve got more heart than you’. I honestly couldn’t say for sure,” he added. “I never saw him celebrate. When you’ve been hit for a six after giving a guy a lot of lip you have no choice but to put your tail between your legs and turn around. But it was great fun. I always looked for a fight on the field and loved it when someone would come back at me,” he said. The former South African pacer said he and S Sreesanth made peace after the match. That’s what makes this game so beautiful. Despite all the issues and on-field spats that happen at the heat of the moment, things get back to normal once the game is over. S Sreesanth will certainly be remembered for his fiery spell of quality fast bowling that demolished the Proteas and of course for his dancing skills that made him famous. Opinion: S Sreesanth - the forgotten hero!